The rediscovered jewels of the Inca Empire, along with the magnificent scenery in the Peruvian Amazon, await you on this tour through Peru. Peru is one of the great originating centers of ancient culture, and on this vacation, you’ll discover its archaeological treasures, appreciate its ancient ruins, and learn about its ancient culture. A highlight of your vacation is a tour to Machu Picchu, where you’ll visit this amazing Inca city. Stand in awe as you witness the ancient ruins surrounded by soaring peaks—one of the most majestic images in South America! Also, see the Temple of Sacsayhuaman, which was built in the early 12th century, and try to figure out how it was built—with some stones weighing more than 350 tons! These are just a couple of this vacation’s many ancient highlights. You’ll also fly over the Nazca Lines and spend time in Peru’s Amazon. Discover the tropical jungle on multiple boat trips and be on the lookout for turtles, caimans, monkeys, river birdlife, and more—not to mention the lush vegetation. Search by canoe for the resident giant river otters, and visit a Parrot Clay Lick to watch the parrots and macaws. Ancient ruins, fascinating culture, and captivating flora and fauna—these all await you on this wonderful Peru vacation. For travelers ready for a new adventure, this tour is for you! Day 2: LIMA–PUERTO MALDONADO–POSADA AMAZONAS. Day 5: POSADA AMAZONAS–PUERTO MALDONADO–LIMA. Day 11: CUSCO–JULIACA–PUNO (LAKE TITICACA). Day 12: PUNO. EXCURSION TO LAKE TITICACA. Day 14: LIMA–PARACAS. BALLESTAS ISLANDS CRUISE & NAZCA LINES. Participation in this vacation requires purchase of the following flights from Globus, not included in pricing: (1) roundtrip air from your U.S. gateway and intra-vacation air segments, starting at $1,516 (based on Miami, departure in January, 2019); or (2) intra-vacation air segments only. 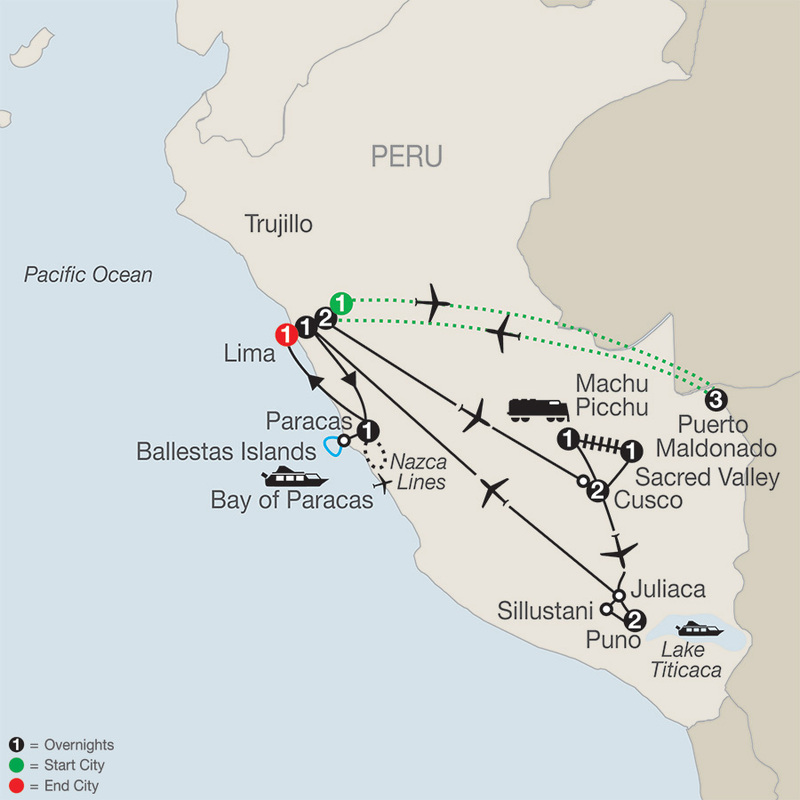 Required intra-vacation air segments: Lima/Puerto Maldonado; Puerto Maldonado/Lima; Lima/Cusco; Cusco/Juliaca; Juliaca/Lima. Air prices were effective on July 11, 2018 and their availability is limited. At the time you purchase your tour, air prices may be higher. Posada Amazonas opened its doors in 1998 and has become a major attraction for those looking for a short stay in the rainforest with the promise of an authentic eco-tourist experience. The lodge is situated within the community's private reserve. Using local materials and architecture combined with modern expertise, Posada Amazonas is community built and as such is a testament to workmanship and endeavor. Posada Amazonas is a 30 bedroom lodge owned by the Community of Infierno and managed with Rainforest Expeditions. Thanks to its accesibility, excellent wildlife observation opportunities, cultural context and comfortable accommodations, Posada Amazonas is ideal for a three night introduction to Amazonia's richest rain forests.